Situated in Wilson , this property offers an ideal place of rest and relaxation. There are a total of 70 rooms on the premises. Guests can avail themselves of the key collection service. Our location is close to numerous local businesses and only blocks away from a wide variety of restaurants. Our beautiful five-story hotel features secure interior entrances and two conference rooms. Our guest complimentary Business Center features 2 computers, laser printer and high-speed Internet access! We also feature a Fitness Center and outdoor pool. All guest rooms have free high-speed wireless Internet access, refrigerators, microwaves, coffee machines, irons/ ironing boards and hairdryers. 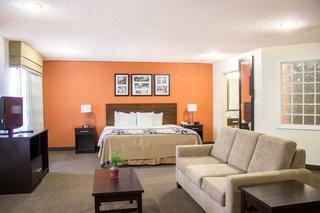 We know you will enjoy your stay with us! Wilson, NC Hotel's Southern Charm Pleases GuestsThis hotel's location in Wilson, NC is right off I-95, just minutes from downtown and Rocky Mount-Wilson Regional Airport. Known as the "City of Antiques," Wilson has much to offer, from gorgeous historic architecture to some of the best barbecue in the state, and the Holiday Inn ExpressÂ® Hotel & Suites Wilson I-95 enables guests to experience it all with ease.If you're visiting Wilson, NC for business, the hotel's proximity to I-95 makes traveling to area meetings a breeze. We're also near many of the major Wilson businesses. The hotel is 1.5 miles from Merck & Co, three miles from BB&T and 10 miles from Bridgestone-Firestone. You can work easily in the hotel with the 24-hour Business Center and free wireless Internet access, the fastest in the state thanks to the community-owned Internet company.You can also find plenty of enjoyable attractions close to the hotel's location. In Wilson, NC, you can browse more than 30 antique stores or take time to smell the roses in the Wilson Rose Garden. Kids love the Imagination Station Science Museum, six miles away and playing sports at the J. Burt Gillette Athletic Complex. We're also near the Wedgewood Golf Course and four scenic lakes.Guests at the hotel can spend warm afternoons in the outdoor pool and begin each day at the tasty, free, hot breakfast bar. If you're planning a trip to Wilson, NC call the hotel now for a wonderful stay. This unpretentious hotel can be found in Raleigh. 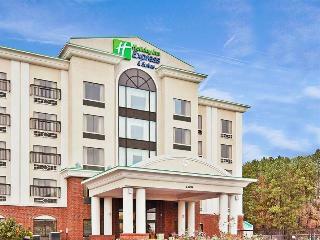 This lovely hotel is set in Rocky Mount. The total number of guests rooms is 76. This accommodation does not accept pets. This charming hotel is situated in Rocky Mount. The 60 welcoming accommodation units offer a perfect place to relax at the end of the day. No pets are allowed on the premises.